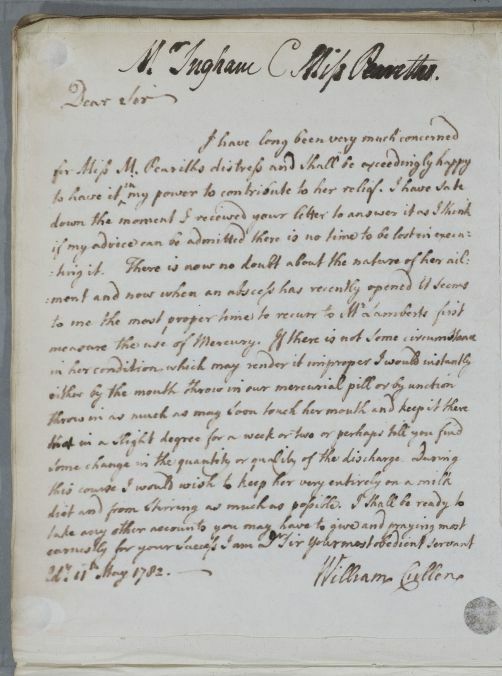 Reply to William Ingham regarding the case of Miss Peariths, with whose illness Cullen has been concerned for some time. Cullen is sure that 'there is now no doubt about the nature of her ailment' and recommends the use of mercury, along with a milk diet. Summary Reply to William Ingham regarding the case of Miss Peariths, with whose illness Cullen has been concerned for some time. Cullen is sure that 'there is now no doubt about the nature of her ailment' and recommends the use of mercury, along with a milk diet.